Whenever I include a demonstration of how to turn an artichoke in a class, I am inevitably asked if canned artichoke hearts may be used in the recipe instead of fresh. This makes me kind of sad because, as with many things, the canned cannot hold a candle to the fresh. But since turning artichokes is a skill that requires some practice, I always answer with a qualified yes….that in some cases—when the artichoke is supposed to be served cooked…when it isn’t the main event….etc.—you can indeed substitute canned. The recipe I’m posting today is a good example. 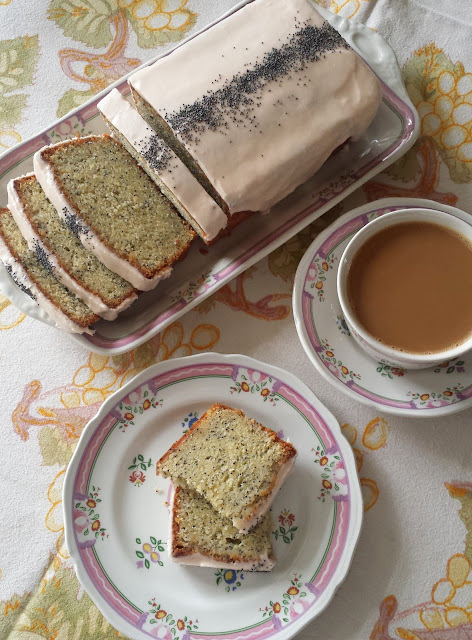 While the tart would be utterly delicious with freshly turned and poached or roasted artichokes, it is still very good when made with the canned variety. I know this, because I made my tart with canned artichokes. Normally I would not have canned artichokes on hand. But I just happened to have half of a can left over after making some of David Lebovitz’s Artichoke Tapenade (from his new book My Paris Kitchen). 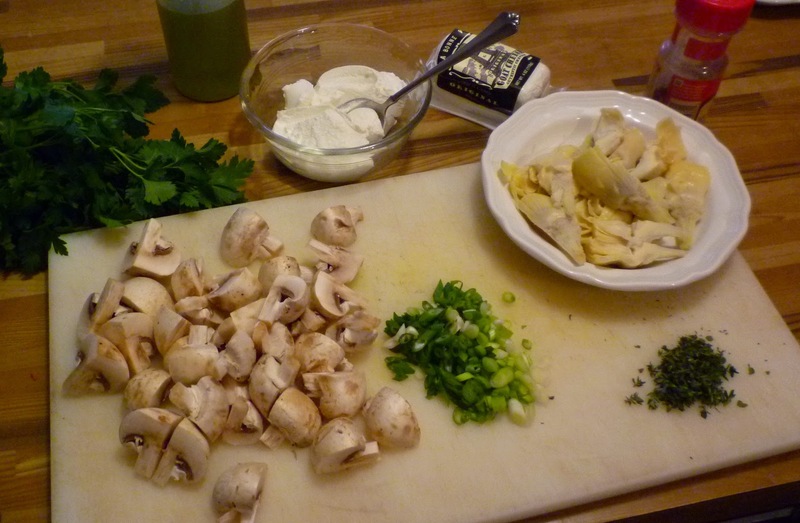 The tapenade is of course made up largely of artichokes….and the recipe specifies canned. While I am sure it would be amazing made with fresh, I am a bit loth to go to the trouble of turning and cooking artichokes just so I can grind them to a fine mince in the food processor. Because I had half of a can of artichokes in my fridge, when a recipe from an old issue of Bon Appetit for an artichoke tart crossed my Facebook feed, I clicked through to examine it more closely, thinking that it might call for canned artichokes. It did. And as I looked it over I was reminded of a zucchini tart that I posted last summer. The tarts are very similar in style—flat, rectangular and topped with a layer of soft cheese and some cooked vegetables—and both are beautiful to look at. In the end I used the Bon Appetit recipe as a spring board, changing it up to suit my pantry and my preferences. For the cheese base I used ricotta mixed with pecorino instead of Feta puréed with heavy cream. And I replaced the Feta crumbles on top with goat cheese. Finally, I added fresh herbs and sautéed mushrooms (I love mushrooms with artichokes) to the mix as well as a final scattering of pine nuts. Both the Bon Appetit tart and my zucchini tart were intended as appetizers, but I decided to make my artichoke tart to serve as a light Sunday night supper. 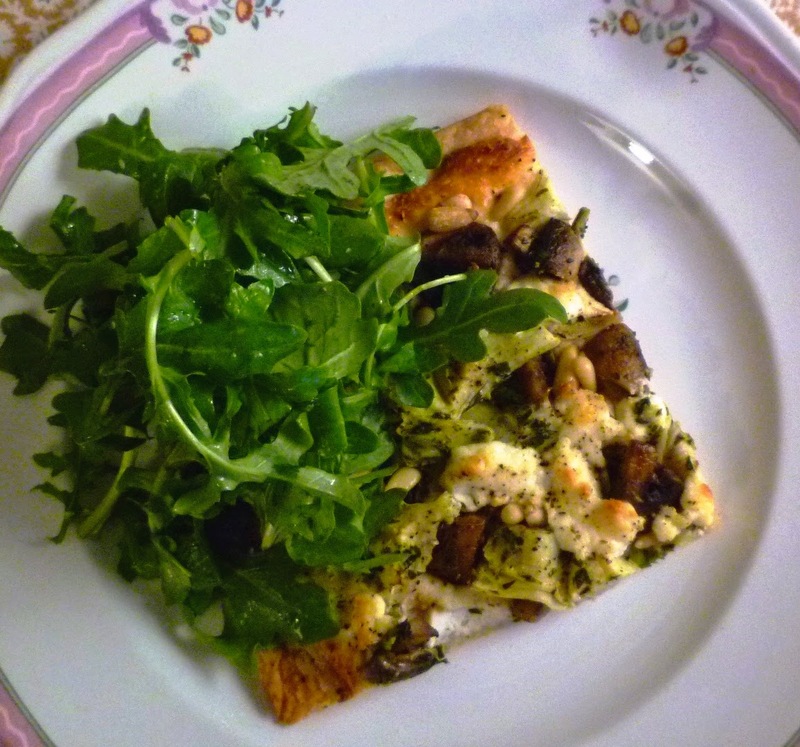 With a fluff of arugula—lightly dressed with lemon and olive oil—and an apple for dessert, it was just right. (Chocolate cookies would have made a nice dessert too, but unfortunately, I was all out.) Had I been hungrier, I could have beefed up the salad with some blanched green beans, toasted walnuts and olives….or served the tart and arugula as an accompaniment to some sautéed shrimp or scallops…or even a grilled or roasted chicken breast. 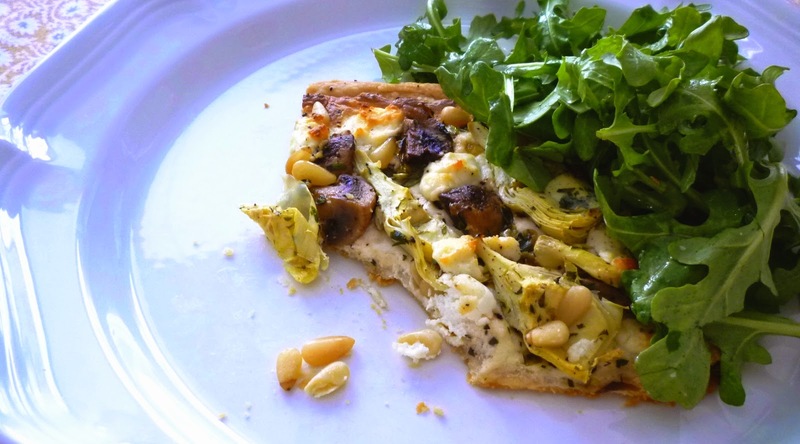 Like the zucchini tart from last summer, the artichoke tart is super versatile. 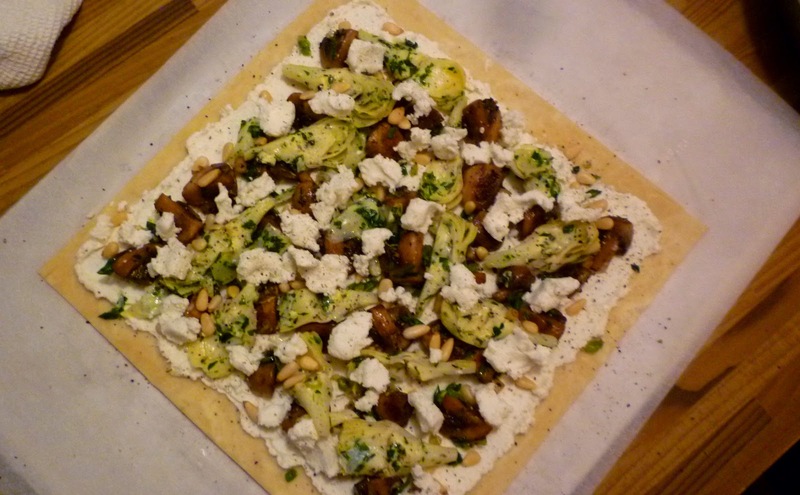 To make little hors d’oeuvres, cut the square of dough into two rectangles and build, bake, cut and serve the tart as described for the zucchini tart. I also think that this tart—cut into six portions and served with a small salad (as I served it for our dinner on Sunday)—would make an elegant first course for a dinner party. Although, I admit, if I were to serve it at a dinner party, I would use fresh artichokes in place of the canned. Either way, the tart makes excellent party food since all of the components (dough, ricotta smear, artichokes and mushrooms) can be made ahead. You can even build the tart ahead, hold it in the fridge and bake it just before serving. And, as I discovered when I enjoyed the leftovers for lunch today, the finished tart reheats beautifully, not suffering in the slightest from being made and baked ahead. On a lightly floured surface, roll the pastry out into a thin (1/8- to 3/16-inch thick) square that measures at least 10- by 10-inches. Place on a parchment-lined baking sheet and chill for at least 30 minutes. In a small sauté pan set over moderately high heat, sauté the mushrooms in a tablespoon of so of olive oil until golden and any liquid that has been released has evaporated. Season with salt and pepper, reduce the heat to medium and add a drizzle of olive oil if the pan seems dry. Add the scallions and 1 t. thyme and continue to gently cook until the scallions have wilted. Remove from the heat. In a small bowl, combine the drained and quartered artichokes with the parsley, remaining thyme, hot pepper flakes and olive oil. Taste and season with salt and pepper. Take the pastry out of the refrigerator and trim to a 9 1/2- by 9 1/2-inch square. Prick all over with a fork. 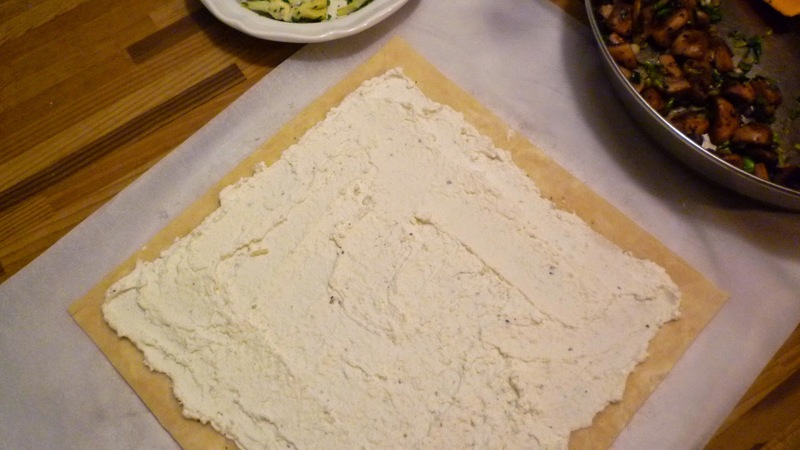 Spread the ricotta mixture in a thin layer over the pastry, leaving a quarter inch wide border of dough visible. Place the pan on the lowest rack in the preheated 375° oven. Bake until the tarts are golden brown, well colored on the bottom and cooked through—about 30 to 35 minutes. Transfer the finished tart to a wire rack so the crust will remain crisp. Cut into portions and serve. If you prefer to use fresh artichokes, you will need two medium artichokes that have been turned, halved and roasted and cut into 1-inch wedges (probably about 4 wedges per half). To prepare small appetizer/passed hors d’oeuvres-sized tartlets, trim the rolled out square of pastry to a 10- by 9-inch rectangle. Cut in half into two 5- by 9-inch rectangles. Proceed with the building of the tarts as directed in the recipe, dividing all of the ingredients between the two tarts. Bake the tarts and cut each into 8 (or more) small squares. By building the tarts in this way (as 2 rectangles instead of 1 large square) each portion will be an “edge” piece and will be sturdier and thus easier to pick up and eat out of hand. Made this for dinner last night - delish. Perfect with a little salad. Thank you for letting me know! I'm so pleased you liked it.